Very interesting move. 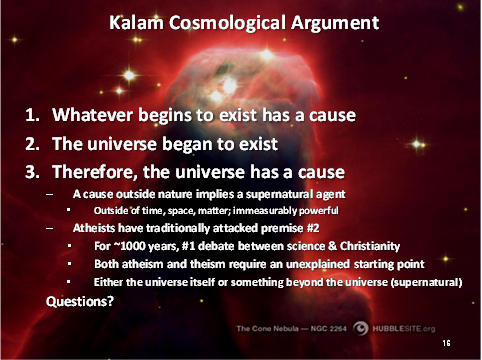 That the universe or universes began to exist is becoming a cosmological orthodox. Leading cosmologist Alexander Vilenkin put it, “[a]ll the evidence we have says that the universe had a beginning” (Grossman 2012: 7). He contended that any any model with expanding time-space must have a beginning. 3. Therefore, as far as we know the universe has a cause. If the idea of God is off being that did not begin to exist, then it is reasonable to accept with theologians, since the case is about beings that begin to exist. Many mathematicians think logic, numbers, sets and-the-like did not begin to exist. For-example they will say 2 + 2= 4 or a triangle necessarily has three angles e.t.c even if the universe was not here or we never came to discover they were so. I don’t see how these beg the question. Do you? It is quite unclear that there are examples of things coming to existence without a cause. Bohr’s Copenhagen Interpretation of quantum physics is a hot topic, but it is one out of ten other interpretations, to which, as far as I am aware, been able to know which interpretation is true. We indeed still remain uncertain though, since it is still only, “as far as we know”. What is your thoughts? The point about 2+2 equaling 4 even if the Universe were not here is intriguing, but my instinct is to see it as nonsense (it’s certainly not something you can prove or provide evidence for), since it postulates something existing in a non-existent state, if that makes sense. I’m nowhere close to a professional philosopher, however, so I’m sure there are nuanced points to the argument I am missing. Of course, besides begging the question, numerous, killer problems with the KCA remain. Generalizing observed laws of physics (things seem to have causes) and applying them to a point when our Universe’s particular laws of physics did not exist (prior to the Big Bang) is poor logic, so is turning observations into fundamental truths (yes, maybe most things we’ve observed do have causes, but that doesn’t mean everything has to have a cause and it certainly doesn’t lead to the necessity of any supernatural creator). I agree that many things are unknown, where I disagree is with any claim that belief in a supernatural being (particularly one who intervenes, is all-powerful, etc) is justified by what we do know at present.